In a longitudinal study with a median follow-up duration of 36 months, 27% of patients with stages 3-5 CKD had hyperkalemia at baseline. Nearly one third of patients with stage 2–5 chronic kidney disease (CKD) have hyperkalemia, investigators reported at the 55th European Renal Association-European Dialysis and Transplant Association congress in Copenhagen, Denmark. 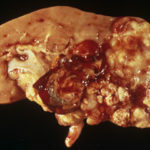 Risk factors for the condition include metabolic acidosis, use of ACE inhibitors and angiotensin-receptor blockers, and diabetes. The findings are from a longitudinal study of 752 patients with stages 2–5 CKD who had pre-planned rather than clinically-driven measurements of serum potassium. The investigators noted that available estimates of the burden of hyperkalemia in CKD patients are derived mainly from large administrative databases, which cannot exclude bias by indication (clinically-driven measurements). Longitudinal studies in CKD cohorts including pre-planned measurements of serum potassium are needed to produce more reliable estimates of the frequency and risk factors underlying hyperkalemia in the CKD population, Vincenzo Panuccio, MD, of CNR-IFC, Reggio Calabria, Italy, and colleagues investigators stated in a poster presentation. 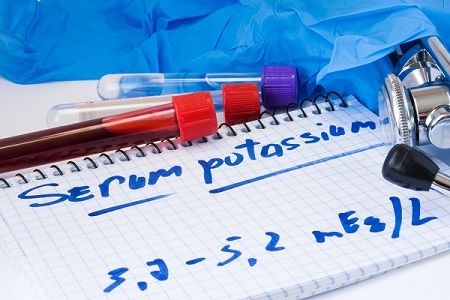 The study found a 27% point prevalence of hyperkalemia (serum potassium level greater than 5.0 mEq/L) at baseline. Also at baseline, 33% of patients had metabolic acidosis (serum bicarbonate level 22 mmol/L or less). Among the patients without hyperkalemia at baseline, the condition developed in 51.7% during a median follow-up of 36 months (incidence rate of 19 per 100 person-years). Overall, the point prevalence of hyperkalemia across study visits rose from 27% at baseline to 30% at the final visit, Among patients with hyperkalemia at baseline, the risk of persistence or recurrence of hyperkalemia was 8 times higher than in those who had normal potassium levels at baseline. In multivariate analysis, patients who took ACE inhibitors and angiotensin-receptor blockers had significant 1.73- and 1.53-fold increased odds of hyperkalemia, respectively. Patients with diabetes had significant 1.48-fold increased odds. Higher serum bicarbonate and estimated glomerular filtration rate were associated with decreased odds of hyperkalemia. The substantially higher risk for persistence or recurrence of hyperkalemia among patients who have the condition at baseline indicates that mild hyperkalemia often is overlooked and/or treated suboptimally, the investigators concluded. “Metabolic acidosis and the use of drugs interfering with the renin-angiotensin system rank as the strongest modifiable risk factors for this potentially life-threatening alteration,” they wrote. The study population had a mean age of 61 years; 60% of participants were male, 35% had diabetes, and 32% had background cardiovascular comorbidities. Panuccio V, Leonardis D, Tripepi R, et al. Epidemiology of hyperkalemia in CKD: A longitudinal study. Presented at the 55th European Renal Association-European Dialysis and Transplant Association congress in Copenhagen, Denmark, May 24–27. Abstract FP340.